Tall ship model USS Confederacy of 1778, in admiralty model style. More photos: of entire ship, of details, of construction progress. Click on the photos for high resolution pictures! Joshua Huntington was an established businessman on the Connecticut coast of Norwich Landing by the time the American Revolution broke out in 1775. Huntington, as the state's agent for the Continental Congress, orchestrated the construction of the frigate Confederacy from 1776-1778. The ship was built in the Thames River at Norwich, and upon its completion on November 8, 1778 was towed to New London for its final outfitting. Under the command of Captain Seth Harding, the frigate Confederacy began its short life as an American ship. On September 17, 1779, Confederacy was commissioned to sail to France to return the French Minister, Count Gerard, and the American Minister to Spain, John Jay. Two months into their voyage, on November 7, 1779, the ship was dismasted by a heavy wind and was nearly destroyed. The ship was forced to seek refuge on Martinique, West Indies in early December. From there, the ship's diplomatic passengers departed for France on the French frigate L'Aurore and after repairs, Confederacy returned to active duty. In 1781, only two short years after it was launched, Confederacy was captured by the British ships Roebuck and Orpheus off the coast of Cape Francois, West Indies, where she had been sent to retrieve supplies for the American army. The British appropriated the ship, changed its name to Confederate, and sent her to England with the supplies and nearly 100 prisoners. 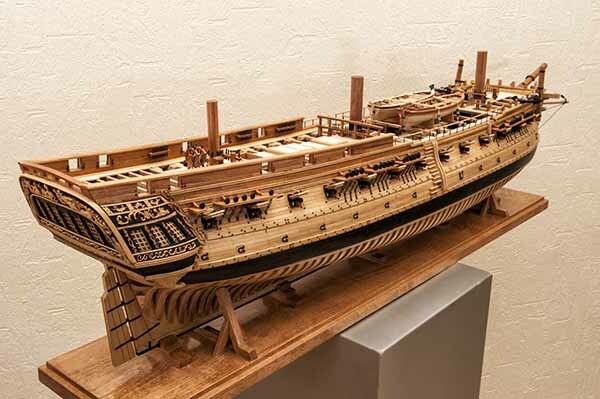 During the 18th and 19th centuries ship models constructed for the Royal Navy were referred to as admiralty models. They were principally constructed to depict proposed warship design. 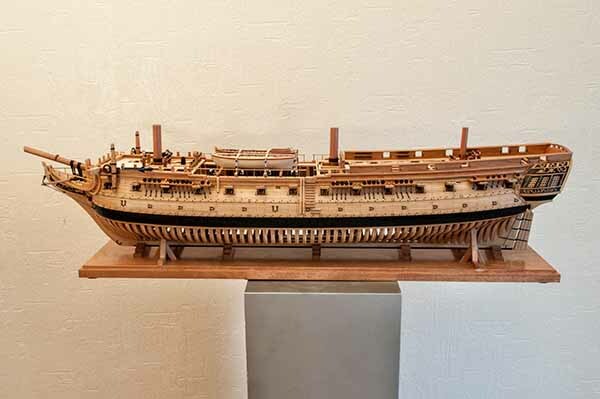 Many of these models illustrated the actual timbering or framing, showed the form of the hull and usually had great detail of the deck furnishings. This model of the USS Confederacy in style of an admiralty model is a very beautiful true masterpiece. The guns and fittings are handmade of brass, the frames are maple wood, the planks are Swiss pear, cherry and ebony wood. The steering wheel is fully operating. If you turn it, the rudder is moved accordingly. There is a CD with 900 pictures on the construction progress. Some of them are shown here. The ship model is 1 : 64 scale. Length is 92 cm, width 17 cm, height 23 cm. There are more detail photos of the model, several views of the entire ship model taken from all directions, and several closer views of the hull and its interior. There are also many photos of the construction progress. Click images to enlarge!